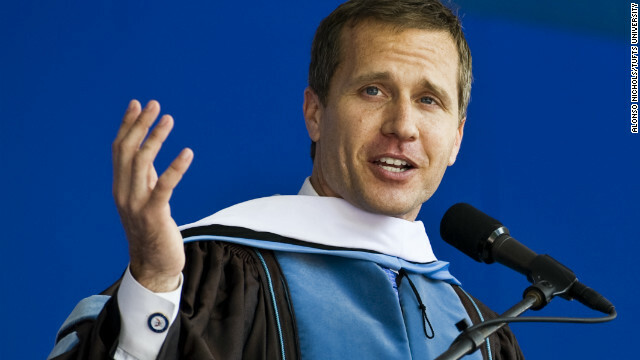 Eric Greitens gives the commencement speech at Tufts University on Sunday. (CNN) - Each spring, I monitor the list of commencement speakers at our nation's leading colleges and universities. Who is chosen, and who is not, tells us a lot about academia's perception of the most important voices in America. Two of this year's most popular speakers were CNN's Fareed Zakaria, who spoke at both Harvard University and Duke University, and EPA Administrator Lisa Jackson, who spoke at both Tulane University and the University of Washington. Perhaps one of the most original choices, and the one who certainly stood out from the rest, was U.S. Navy SEAL Eric Greitens, who addressed the 2012 graduating class of Tufts University Sunday. It's not often that elite universities honor military service members with commencement addresses. Gen. Dwight Eisenhower once spoke to a graduating class at an Ivy League university and remarked, "Your business is to put me out of business." So I applaud Tufts University for inviting Greitens. He is not a household name, but he should be. The 38-year-old Rhodes scholar and humanitarian worker turned U.S. Navy SEAL served multiple tours overseas fighting terrorist cells and received several military awards. Today, he is the CEO of the Mission Continues, a nonprofit foundation he created to help wounded and disabled veterans find ways to serve their communities at home. To the graduates of Tufts, Greitens issued a unique challenge, one rarely heard at commencements today: to sacrifice, to serve one's country and to live magnanimously. He called students to think above and beyond their own dreams, their own desires, and to be strong. Aristotle called this megalopsychia, greatness of soul, and considered it one of the greatest moral virtues. What an exceptional person and fine example this man is to our soldiers and young people. I would love to hear him speak. May the Mission Continues be blessed with great success. He hit the nail on the head. What a wonderful person. Rhodes Scholar to Navy SEAL. I salute him and Tufts University for aksing him to speak.